Section 4.3 allows you to record the relationships between the causal factors involved in the incident. Completing this section is important, as it will allow you to conduct a systems analysis of the causal factors involved in your incidents using the Accimap program. Create a list of potential relationships between the factors you have identified. 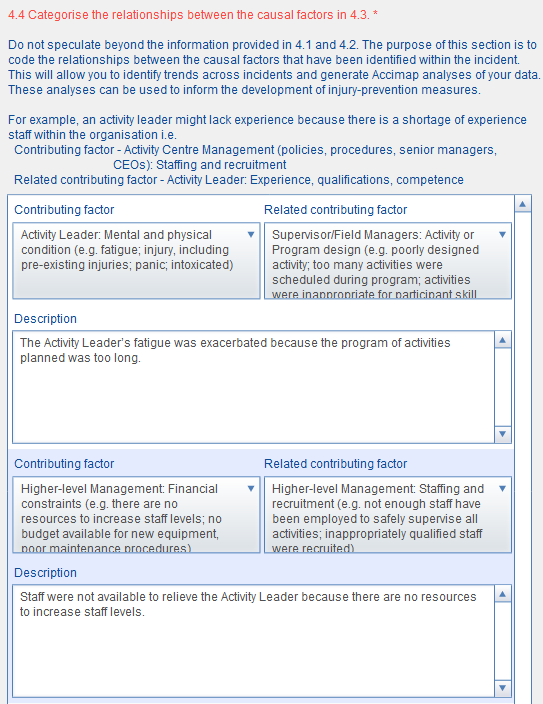 The Activity Leader’s fatigue was exacerbated because the program of activities planned was too long. Staff were not available to relieve the Activity Leader because there are no resources to increase staff levels. Enter these descriptions into Section 4.3. You must add descriptions, otherwise the information will not be included in the Accimap. Select the categories from the taxonomy that best describes the relationships.